What dog doesn't love a soft, grassy play area? Artificial grass looks and feels like the real thing, only it's better. 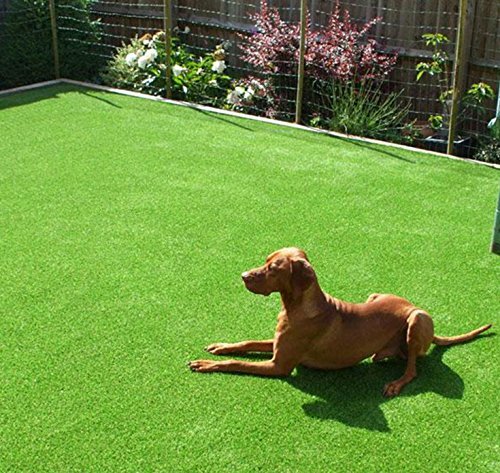 Fake grass is perfect for pets and their friends, because it's designed specifically for dogs. Artificial grass mat for dogs is a quick solution for a muddy backyard where your dog could use on a daily basis. It's perfectly safe for your family and the environment, because it's non-toxic and allergen-free. With artificial grass, you can have a gorgeous yard and a happy canine. Artificial Lawn turf can be used at backyard, garden,patio,balcony,swimming pool,outdoor decor,deck, door mats, dog area. 1.Realistic grass look like real grass, have a nice touch. Adopt the principle of bionics production feels great on your feet. Kids love it so much they take their shoes off as if it was carpet. 2.Back drainage holes have good water permeability, dry quickly, prevent from mildew. Grass don't absorb odour after dogs pee. 3.Synthetic turf is heavy, tough, durable, anti aging, no wear and tear for long time, grass don't fall off. 4.Artificial grass made to withstand weather the harshest sun or torrential rain, enjoy natural-looking vibrant green grass all year round. Friendly Reminder:Please unpack the package and let out the smell at the very start,make grass fluffy. If you cut the grass root, grass will drop, so please cut carefully. 100% SATISFACTION GUARANTEE: We are factory outlet. We're happy when you're satisfied. If you have any issues with your synthetic grass simply reach out to us and we'll do all we can to make it right. LOWER MAINTENANCE--Evergreen artificial turf mat is rubber backed with drainage holes, easy to clean and install, save costs and time to maintain. No mowing. No fertilizers. No pesticides. REALISTIC APPEARANCE-- Thicker backed rubber, denser grass, taller blades, very natural looking fescue-like 4-tone color that closely resembles the real grass. The safe pet grass has a lovely manicured look. Every roll looks same color. If you have any questions about this product by GT LIFE, contact us by completing and submitting the form below. If you are looking for a specif part number, please include it with your message. Nolita Rugs Abbot Polypropylene Grey Indoor/Outdoor Rug 3'11" X 5'7"
Ottomanson Jardin Collection Natural Solid Design Indoor/Outdoor Jute Backing Synthetic Sisal Runner Rug, Dark Brown, 2'7" x 7'0"